Projects Blog — Informing Design, Inc.
Informing Design’s home base has served as a laboratory for much of the firm’s work. The firm’s focus on city de-complexifying maps and signs began with its blockbuster first book. The firm’s first map book prepared entirely within graphics software. Maps were organized as a kind of animation, scanning the region from West to East, and then North to South, zooming in and out as needed. The firm’s remapping of the interstate highway system as a polar coordinate system centered on New York City first appeared in this book. Organized similar to the above book, it featured dozens of hints as to how to beat traffic and find good parking places. The firm’s signature de-complexifying mapping tool was first developed to conquer the City with a new comprehensive traffic sign system. The firm was tasked with developing a parking sign system for the parking lots serving the then brand new Heinz Field, home to the Pittsburgh Steelers. The solution involved big color-coded dots that organized the lots by access sequences. Transit mapping and schedule design has been a primary research interest of the firm from the beginning. 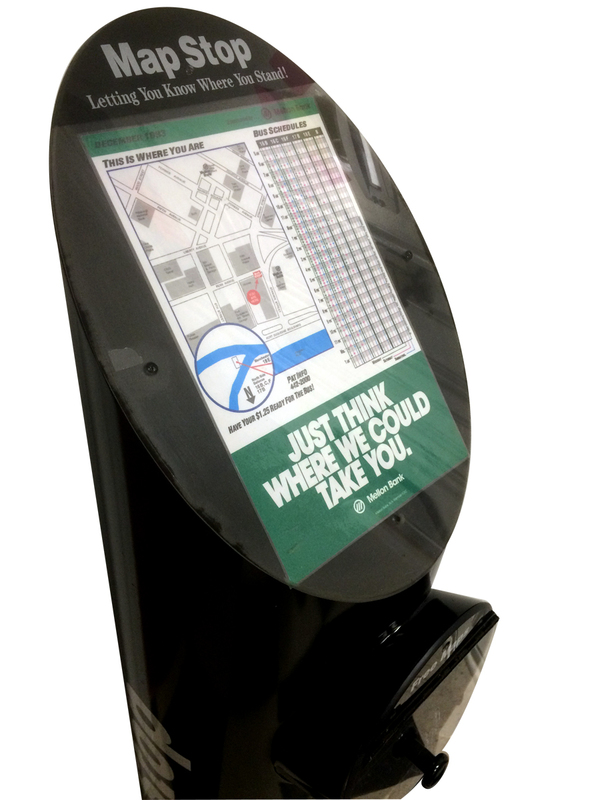 An experimental program to place map kiosks at dozens of locations in Downtown and Oakland, and stuffed with quarterly “Map-to-Go” newspapers. 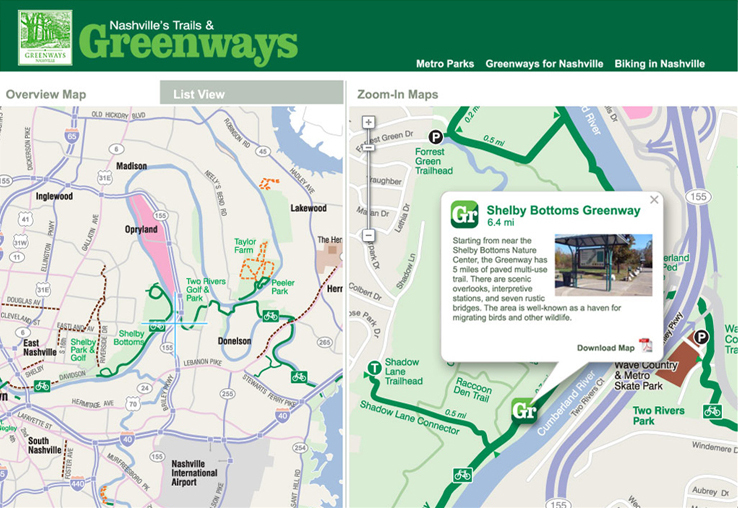 A new kind of time schedule chart was developed that enabled a quick read of bus arrival times for up to two dozen routes at a give stop. This was the firm’s first effort to simplify an extremely complex system of bus and light rail routes. The firm went on to develop transit “spider maps” with its 3-D maps of Downtown in the center, and with simple route info radiating out in a band of blue circling the map. Available later this year on an app. The firm designed a bike map for the region around the Pittsburgh International Airport in multiple zooms. Routings were organized as “tributaries” leading in and out of the main “river” of the Montour Trail. Look up “ACTA Bike Map” on the iOS app store or Google’s Play store; or go to actabikemap.org. On its own, the firm discovered and mapped a “secret” escape route from the center of the City on marathon Sunday and distributed it on-line. This led to the firm becoming the de facto cartographer to the Marathon in subsequent years. The firm produces dozens of maps ranging from course maps with elevations to administrative maps and maps for the State Police helicopter unit. Client: Pittsburgh Three Rivers Marathon, Inc.
To deal with a construction-impacted graduation site, the firm used its “orange peel perspective” to map the stadium, the surrounding campus and off-campus sites so that egress pathways would be easy to understand for visitors from Arabic and far eastern countries. Informing Design once mapped every retail establishment in Pittsburgh and its suburbs. First deployed in experimental shopping atlases in the late 90s. The firm designed a map pamphlet for the historic open-air market district of Pittsburgh that is also one of the area’s most popular night spots with dance clubs and restaurants. The pamphlet has been called “Pittsburgh’s most requested map” by the CVB. It features building by building detail on one side, and then an overview map of Greater Downtown on the other. In addition to cartographic expertise, the firm also has illustration expertise in-house with an award-winning artist on its staff. Research, art and text were developed for a series of 12 interpretive panels installed along Pittsburgh’s number one tourist attraction: the Grandview Promenade on Mt. Washington with the region’s fanciest restaurants and dramatic views of Downtown, reached by iconic inclines. Included were an original water-color rendering of the view of Downtown and an illustration of the Underground Railroad stop at Bigham Manor House. For the Senator John Heinz History Center, the firm prepared two large wall panel displays on the theme “What Makes Pittsburgh Pittsburgh.” One illustrated Pittsburgh’s position geographically in the context of the nation (and the Lincoln Highway elevation map from the 30s) and in the context of Pennsylvania. The other panel zeroed in on the City itself with a topographical map with elevation contours and a series of illustrations featuring major neighborhood highlights. In 1995, the firm first untangled the US interstates into a polar coordinate system centered on New York for its “Finding Yourself in Pittsburgh” atlas. As part of a long-term project to remap the entire country, the firm has completed an untangled map of state and national highways east of the Mississippi at a 1:4,600,000 scale (equivalent to the Google Maps zoom level 7, with the 50 mile scale marker). As part of this national mapping, it has also created larger scale maps for many major cities (Google zoom level 12 and higher). One of the most fun road puzzles the firm has ever tackled. As part of its extensive state-wide work in Maryland, the firm has mapped the entire Baltimore-Washington region using its de-complexifying tool. Central/NW/NE D.C. turned out to be one of our biggest challenges, with its orthogonal grid of numbered and lettered streets, made messy by the overlying grid of diagonal streets mostly named for states. How could this be untangled? We realized that driving around D.C. can be thought of as a game of chutes and ladders. The diagonals are typically the best way to drive from neighborhood to neighborhood, with the orthogonal grid most useful for very local travel. Things would be fine if this were the only issue. But there are “secret” underpasses galore, especially approaching major circles, and left turn restrictions almost everywhere you (want to) turn. 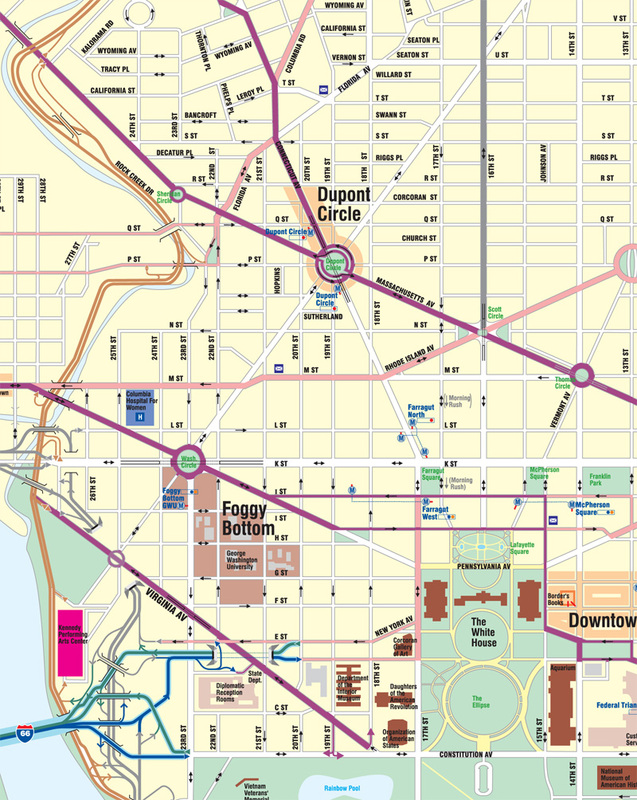 And then there is the granddaddy of complexity: Dupont Circle. Yes, we managed to unlock its secrets, too. Finally, the Parkway and expressway ramps can be pretty crazy — for instance, it almost seems as though every senator got his or her own ramp in the interchange just south of the Capitol — all of which we also untangle. The firm has worked with top transportation figures in Montreal and Quebec. The firm’s first Canadian map was of Downtown Montreal, untangling the complex over and under interconnections between the central expressways and the local street grid, including one interchange which official maps and consumer maps alike had gotten wrong (or missed completely). It also untangled the local street gird, serving to highlight business district densities and attractions. The firm then went on to remap the entire island of Montreal for trucking use, using shaded “islands” to indicate no-go zones for trucks. The firm has studied Baltimore extensively as part of its Maryland state-wide project. As part of its extensive Maryland state-wide work, the firm has mapped the entire Baltimore-Washington region using its de-complexifying tool. 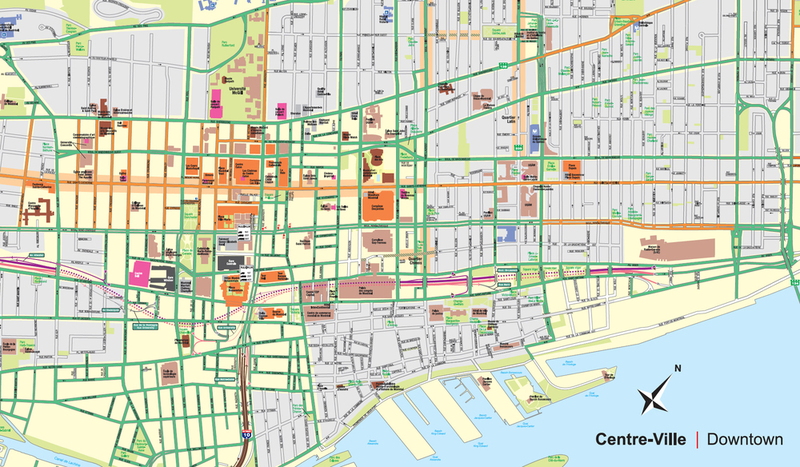 Within Central Baltimore, close-up maps have also been prepared, with special attention to attraction-dense areas, parks and campuses. 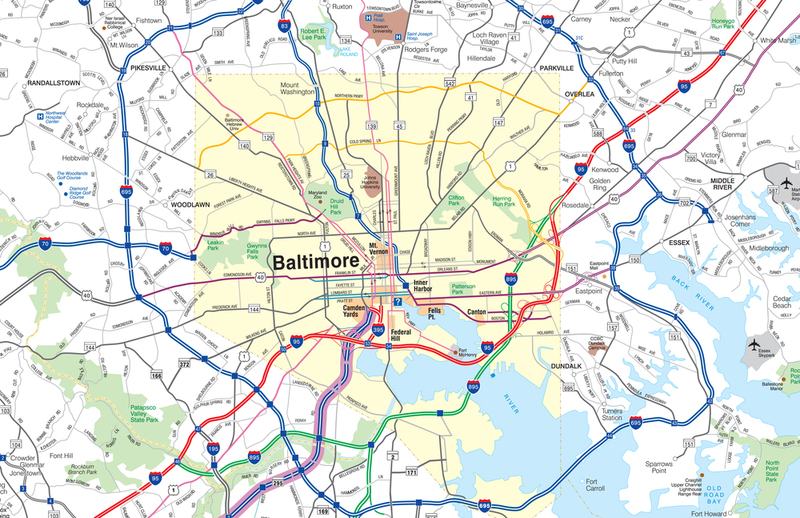 The complex inter-connectivity issues between all of the expressways and parkways in and around Baltimore have also been untangled in detail. In the 70s, Baltimore was one of the first cities to devise a comprehensive wayfinding sign system. But its three-dimensional sign design did not make for easy upkeep, and over the decades signs kept getting indiscriminately added, to the point that clutter and overload has become a serious issue. The firm was tasked with developing a concept for a replacement system using its Areas and Corridors approach (see the Maryland Project). By creating themed corridors within discrete areas (Inner Harbor, Camden Yards, Westside, Little Italy, Fells Point, etc. ), the current sign load would be able to be reduced dramatically even as more attractions and parking for those attractions would be able to be signed. Respecting the blue and green tradition of the original signs, the firm created a freshened up version using green to signify inter-neighborhood guidance and blue to signify within-neighborhood guidance. In 2001, the firm was inspired to design a whole new map of Manhattan. During the latter months of 2001, an Informing Design team could be seen driving a teal Camry around Manhattan. What were we doing? Meticulously taking note of unusual conditions pertaining to every street and every highway ramp on the island. Soon we managed to achieve our goal: a new street map of Manhattan that nailed, in detail, how every road and ramp works, how colliding street grids can resolve themselves into something comprehensible, and where to find virtually any amenity a visitor might need via a curated, easy-to-use index. Using our signature de-complexifiying mapping approach, we untangled the Financial District and Greenwich Village, made clear how the major north-south arteries suddenly change names on the Upper West Side, and highlighted how Broadway — the longest road on the island — sprouts mirror image streets on its western side in Lower Manhattan and gives rise to several “tributaries” on its eastern side. We also untangled every single ramp on and off every bridge and tunnel, along with the Henry Hudson Parkway on the west side and FDR Drive in the east. No consumer map of Manhattan had ever gotten all of this right. The printed version of the map consisted of a single long, narrow piece of paper, folded like an accordion (the inspiration for the map’s “A” name) so that the user could handily examine several dozen north-south blocks at a time without having to deal with complicated unfolding and re-folding. With the West Side on one side of the map and the East Side on the other, a simple flip was all that was needed to switch between the two. Available only in New York City, it sold out within a year. Frederick Law Olmsted was famous for designing tangled trail systems in his parks. Central Park is famously full of such “rambles.” Where do you begin to think about untangling the park? It turned out that answering a key wayfinding question was the solution: what’s the best way to walk across the Park between the West Side and the East Side? There happens to be a discrete set of moments where doing so is optimal, and mapping these routes gave us the east-west lines for our “gridding” of the Park. For the north-south lines, we highlighted the paths that connect up and down from the east-west transversals to key locations within the park. Voila: Central Park Untangled. The Manhattan subway has an above-ground problem: the subway lines like to bounce around, first under one major north-south artery and then under another. To clarify what is happening, the firm designed a subway map that superimposes these major arteries over the subway lines so that the user never loses sight of the above-ground context of their travels. Downtown “Winston” is where Informing Design experimented with a new kind of sidewalk map installation that turned into an instant hit. 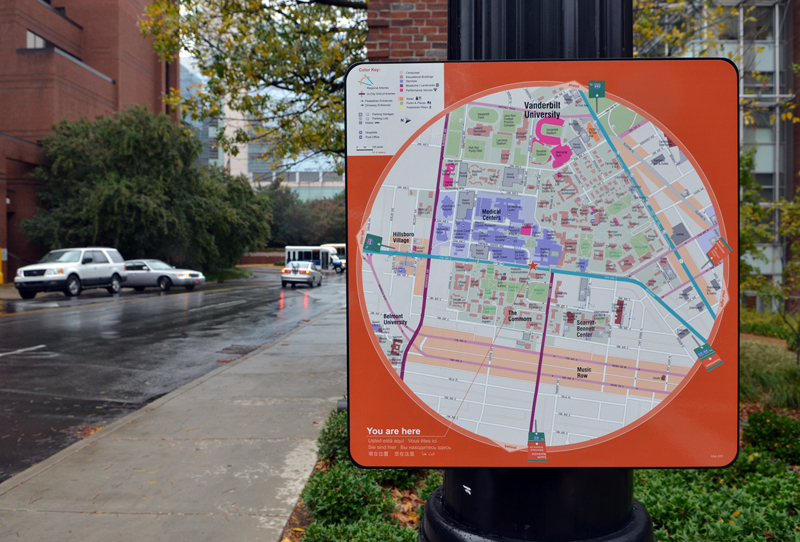 The mapping system we developed for the city also undergirded a Downtown traffic wayfinding sign system. The Downtown Partnership wanted to develop a brand identity distinct for the “modern” Winston as opposed to the historic district of “Salem.” We took as our inspiration the classic art deco Reynolds Tower to create a silhouette “W” as the logo. Then with the help of local architecture firm, Walter Robbs, abox was designed to be placed on existing light poles above sidewalk map installations. This box anchored both pedestrian directionals and the new “W” brand. What we discovered, due to budgetary constraints, is that when it comes to sidewalk map kiosks, less is not just better, it’s a lot better! We were able to deploy three dozen kiosks for around than $500 per installation, including pedestrian directionals and logo box. The secret? Using existing light poles and mounting maps like they were traffic signs (printed on non-reflective vinyl, with back of the sign and mounting hardware painted black to match the poles). Installed in natural “sidewalk theaters,” the maps were an instant hit. See the “Less Embarrassing Map Kiosk” for the full story. For the design of wayfinding traffic signs for its Downtown, the firm used the angled sheds of old Salem as its inspiration for an “angled shed” top to the signs. The firm also remapped Winston-Salem at two scales: a Downtown close-up map and a map of Greater Winston-Salem. Of special interest were the moments where the radiating grid of regional arteries collides with the in-town rectilinear grid. Our signature de-complexifying map tool untangles these moments and make travel clear, with maps or with signs. A 3-D model of the Downtown map was created to generate site-specific orientations for each of the dozens of sidewalk map installations. Winnipeg is one of three cities where Informing Design had the opportunity to develop a complete city solution: traffic signing as well as pedestrian maps and signing. The firm developed an off-kilter curved-top wayfinding sign to complement the existing (off-kilter) modernist city logo which is displayed in the top portion of the sign. A natural loop within Downtown was highlighted including Portage, Main and Broadway, a loop that is actually the nexus of highways Province-wide. Signed routings in both directions along this loop are able to guide motorists to parking for all important civic and shopping destinations in Downtown. In fact, a single street in the middle of the loop turned out to be a “secret” route to most of the Parkades in the center of Downtown. Like other major Canadian Cities (with the obvious exception of mild weather Vancouver), Winnipeg’s Downtown features an interior walkway system that interconnects most major buildings. And like the other systems in Canada, finding your way through these interior mazes can be challenging. The firm’s solution was to map the hallways as though they were a subway system, treating major entrances as the “stations.” A 3-D model of Downtown was created and used as a base for system maps placed throughout the network of hallways. For the full story, see the “Enjoying Blind Man’s Bluff at 40 below” case study. The firm also deployed pedestrian map kiosks on outside sidewalks throughout Downtown, all based on the 3-D model which was developed. One of the by-products of this system was a series of Visitor Maps which Tourism Winnipeg uses in its publications as well as online and in print form. The firm keeps these maps up-to-date, with major revisions every other year and minor revisions in between. Informing Design has been at work on state-wide projects for the Maryland State Highway Administration since 2001. Bob Firth, founder of Informing Design, first presented his mapping tool as one of three speakers invited to a specially assembled symposium on “Getting Lost” at the National Academy of Sciences in Washington in 1996. It was there that he met one of the leading state highway officials in the country, Tom Hicks, then head of the Office of Traffic and Safety at the Maryland State Highway Administration. By 2001, Bob was tasked with developing a whole new kind of tourism-oriented sign system based on his concepts. Based on guidelines developed by Informing Design, the Maryland State Highway Administration embarked on a massive new sign system, replacing all current Tourism-related state signing. Based on Bob’s “aggregate effect mapping” tool, the Tourism Area and Corridor (TAC) Sign System creates routes to tourist areas, then along area-spanning corridors to reach qualified attractions, with relatively few attraction-specific signs required. Such signs are needed only starting from the last turn off of the defined corridor. 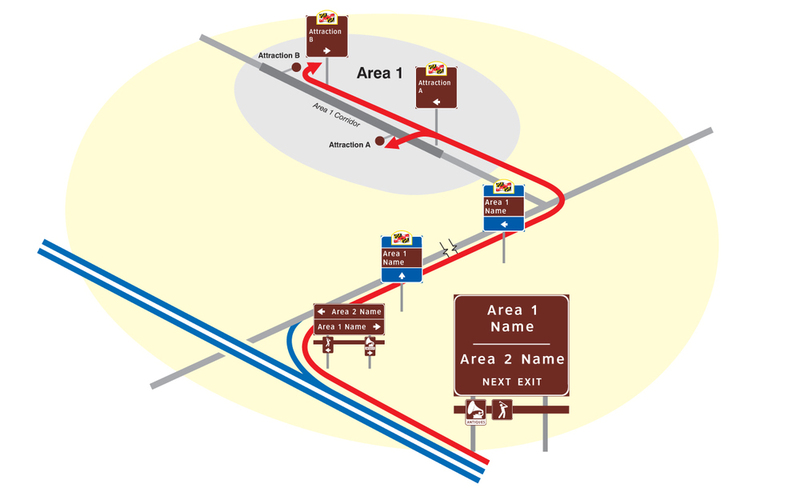 This hierarchical routing system was developed in response to an explosion in attraction-specific signing and as an alternative to the FHWA TODS system (Tourist-oriented Directional Signs), which only has one type of sign – attraction-specific ones — and allows those signs to run for many miles from a state highway. Because of the way it is organized, TAC not only highlights the names of tourist areas much more effectively and prominently, starting from interstates, but it also allows for all attractions in an area to benefit from guidance without unsightly sign clutter and information overload. Moreover, TAC also works in cities and towns by directing motorists to parking facilities by the groups of attractions they serve, something TODS cannot do. The firm designed the traffic sign system for the Thurgood Marshall BWI Airport as well as sign systems for the entire region of hotels and business parks around the airport. A new feature was the creation of an “Airport Loop” which greatly simplified guidance and reduced the need for signing, as motorists followed the simple loop markers to carry them from one destination zone to another. For historic Cambridge on the Lower Eastern Shore of the Chesapeake Bay, the firm developed new pedestrian maps and deployed them in its “Personal Map Station” format. (See “A Less Embarrassing Map Kiosk” case study.) The area around Cambridge was mapped at a farther out zoom, and provided as an insert in a corner of the main map. Interpretive illustrations were provided on the borders.